Choosing the right cold medicines is very important for all dietetics. You need to check the ingredients and consulting a doctor is usually recommended. People who suffer from diabetes have an increased risk of getting an infection, including a viral infection or a common cold. This is linked to a weaker immune system that these persons might have due to diabetes. Also, it is harder to keep the normal and balanced blood sugar levels while being sick than normally. As the human body normally tries to fight the infection and deal with viruses or bacteria that have entered the body, certain hormones are released which will interfere with the effects of insulin, increasing this way the levels of glucose in the blood and making diabetes harder to keep under control. Managing diabetes while being sick is very important. Getting a common cold or flu is common and using over-the-counter cold medicines for treatment, is something that we all do. However, when it comes to diabetics, which cold medicines are safe from many brands of cold medicines available today? Certain products will treat only one symptom like nasal congestion or a cough, while other products will treat several symptoms at the same time. It’s up to you which type of cold medicine you prefer. When it comes to choosing cold medicine, it is very important to know the ingredients of every medication as these can affect your glucose levels in the blood, making your diabetes get out of control. You probably don’t want that? There are two types of ingredients commonly found in medications including cold medications, active and inactive ingredients. Active ingredients are the ones that actually work and treat the symptoms of a cold, while inactive ingredients don’t have any medical value. Inactive ingredients are usually coloring, flavoring or filler substances. Before choosing a cold medicine for diabetics, read the labels carefully and look for its ingredient content, for both active and inactive ingredients. Pain and fever reducers such as acetaminophen may not be recommended for people diagnosed with diabetes, especially those who have liver or kidney problems, as acetaminophen can be toxic to these two body organs. Before using acetaminophen, you should consult your healthcare provider, especially in cases when dealing with kidney complications as well. NSAIDs like ibuprofen, naproxen, etc., are commonly used for the treatment of fever, pain or body aches related to flu or cold. Ibuprofen should be used with precaution as a cold medicine for diabetics because it increases the hypoglycemic effect of insulin and oral diabetic medications. Ibuprofen also has an impact on the liver and kidneys too. On the other hand, naproxen is not recommended for people with severe kidney, liver and cardiovascular problems. Naproxen also increases the risk of hyperglycemia. 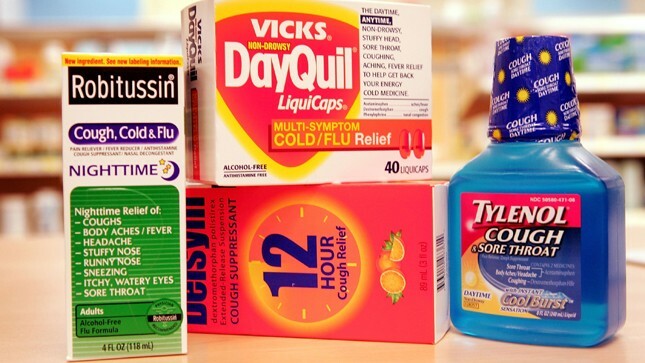 Decongestants are commonly used for the treatment of common cold and flu. Epinephrine, pseudoephedrine, phenylephrine, phenylpropanolamine are ingredients commonly found in decongestant nasal sprays, but not only. These ingredients are sometimes found in oral cold medicines as well. Decongestants work by drying up the secretions in the nasal passages. However, these medications can decrease the effects of insulin or oral diabetic medications, interfering with the blood glucose levels. Decongestants also increase the blood pressure levels. For this reason, they should be used with precaution in people suffering from high blood pressure. Phenylpropanolamine was a decongestant commonly used for the treatment of nasal congestion. However, this medication was recalled by the FDA in 2005 due to an increased risk of strokes. Cough medications like guaifenesin or dextromethorphan should also be used with precaution as a cold medicine for diabetics. Guaifenesin works by loosening up the mucus, making it easier to cough the mucus up. Dextromethorphan is another ingredient commonly found in cough medication which when used in recommended doses is safe for diabetics as well. Antihistamines are another type of medication used for the treatment of common cold and flu. Antihistamines are cold medications for diabetics as well. Loratadine is a second generation antihistamine which you can get as over-the-counter medication. A good thing with loratadine is that it appears not to cause any problems in people with diabetes, but it also does not cause sedation. Brompheniramine, doxylamine or chlorpheniramine are other types of antihistamines used for the treatment of common cold and flu. They can be used in a combination with other active ingredients. These antihistamines have no direct impact on diabetes, even though in elderly patients they can increase the risk of various side effects. Diphenhydramine can lower the blood pressure in certain cases. Choosing the right cold medication for diabetics can be a challenge sometimes. However, it is good to know that these medications will not cure a common cold or flu. They will only temporarily ease the signs and symptoms. Everyone gets a cold or flu every now and then, regarding of diabetes. However, being diabetic and getting a cold or flu can increase the risk for various complications. First of all, it is very important to stay at home and get all the necessary time to recover. The blood sugar levels should be checked every 4 hours and sometimes even sooner if your doctor recommends you so. The temperature should be measured regularly as well. Regular testing for ketones is also necessary, especially when the level is over 240 mg/dL. Consult with your healthcare provider immediately if it shows ketones. Drink plenty of water while you are sick. A broth is a good choice as well. Eat about 50 g of carbohydrates every 3 to 4 hours. Sports drinks, apple juices, unsweetened applesauce, soup, etc., are great choices if you can’t eat solid food. Take the oral diabetic medications and insulin just as your doctor has prescribed them to you unless he/she recommends you otherwise. The best thing is to prevent common cold or flu in the first place by keeping your disease and blood sugar levels under control, especially when diagnosed with type 2 diabetes. If your blood sugar levels get out of control, your body will have a harder time to fight the infection. Getting the annual flu shot and other recommended vaccines is also a wise thing to do in order to prevent common cold and flu. What Symptoms Will Diabetes Bring? All About Benadryl: Usages, Function and More!